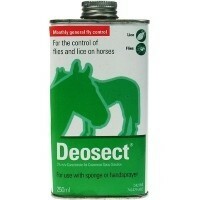 Deosect Solution for the control of flies and lice on horses. Dilution rate: 20ml Deosect to 1lt Water. Horses: 500ml of diluted solution per animal. Ponies: 125ml of diluted solution per animal. Have used this product to treat lice on my ponies, very concentrated so it makes a huge quantity and is therefore good money over the long run. Very effective, killed the lice in 2 days but will repeated as recommended in 2 weeks. Can also be used as fly control in summer.